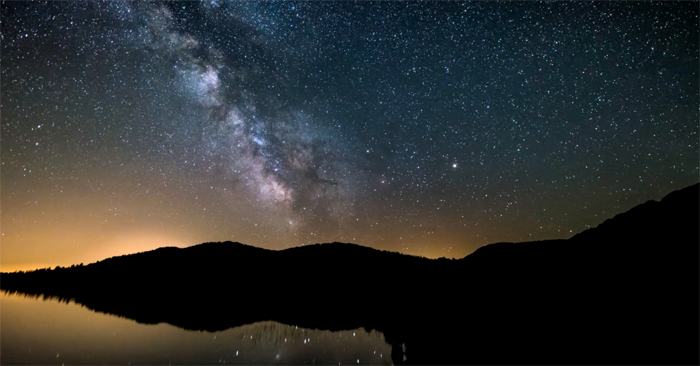 The summer night sky is seen over Lac Des Pises in Cévennes National Park, France. Photo ©Guillaume Cannat (autourduciel.blog.lemonde.fr). Dark night skies remain accessible over southeastern France, thanks to efforts undertaken by a region of the country described by National Geographic as “classic landscape of traditional French life”. In recognition, Cévennes National Park has been accredited by the International Dark-Sky Association (IDA) as a Provisional International Dark Sky Reserve. Cévennes National Park encompasses some 2,973 square kilometers of the French départements of Lozère, Gard, Ardèche and Aveyron. Its lands slope gradually from the plains of the Languedoc region to the Mediterranean Sea, with rivers carving out deep valleys. The Park’s rugged landscapes have discouraged development throughout history, and it remains one of the country’s last populous regions. The encompassing buffer zone brings the total land area in the new International Dark Sky Reserve to 3,600 square kilometers, making it the largest such Reserve in Europe. The new IDA status contributes positively toward the conservation of a number of sensitive plants and animals found only in the region. As part of its nomination, Park staff and volunteers inventoried nearly 20,000 exterior light fixtures in the new Reserve in order to assess them for compliant with the Park outdoor lighting policy. Two regional electric power authorities participated in the effort in order to assure an accurate audit. Given that the majority of the lights require retrofits in order to meet the minimum lighting policy compliance threshold for International Dark Sky Reserves, Cévennes National Park requested Provisional status from IDA. This allows the Park three years, during the Provisional period, to perform enough lighting retrofits to meet the International Dark Sky Places Program minimum standard. Over 700,000 Euros of European Union funding has been secured for the first phase of the retrofit project. The Park developed an extensive public outreach program to support its nomination, including promotion of the annual ‘Jour de la Nuit’ (“Day Of The Night”) and ‘Nuit de la Chouette’ (“Night of the Owl”) awareness events, formation of partnerships with the Astronomical Society of Montpellier and Partage & Connaissances Association, and holding extensive community meetings to explain the International Dark Sky Reserve project.